Provide comfort for the family of Michael Glazier with a meaningful gesture of sympathy. Glazier, Michael Ignatius, 91, of Leesburg, Florida, passed away on March 17, 2019 at his home in Leesburg. Mr. Glazier was born in Tralee, Ireland to his parents Michael and Elizabeth Glazier. He is survived by his loving wife Johanna Catherine Glazier. Mr. Glazier's extended family is Sean O'Loughlin, Pat O' Loughlin, Rory O' Loughlin, Phil Gorey. He earned a Bachelor’s degree in college and was an owner and operator of a publishing company. A Mass of Christian Burial will be held on March 27, 2019 at 11 AM at St. Paul’s Catholic Church in Leesburg and will be laid to rest afterwards at Lone Oak Cemetery in Leesburg, FL. Arrangements entrusted to Beyers Funeral Home and Crematory, Leesburg, FL. 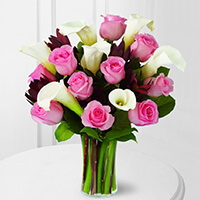 To send flowers in memory of Michael Ignatius Glazier, please visit our Heartfelt Sympathies Store. The Staff of Liturgical Press sent flowers to the family of Michael Ignatius Glazier. In grateful memory of Michael Glazier, a publisher of extraordinary acumen who served authors, Church, and world with grace and wit. The Staff of Liturgical Press purchased the The FTD Warm Embrace Bouquet for the family of Michael Glazier.